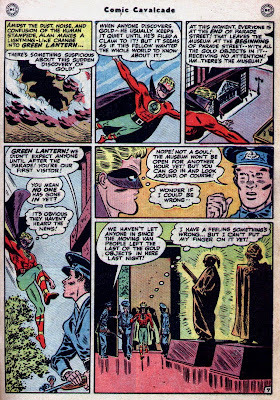 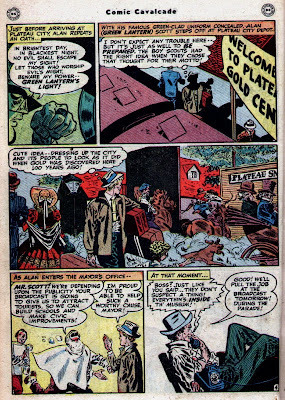 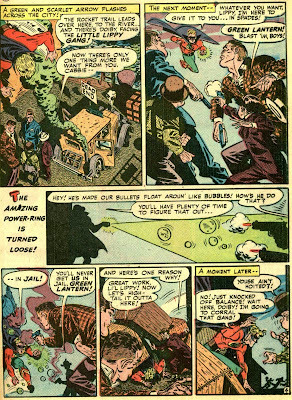 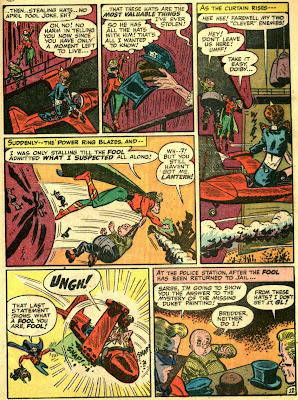 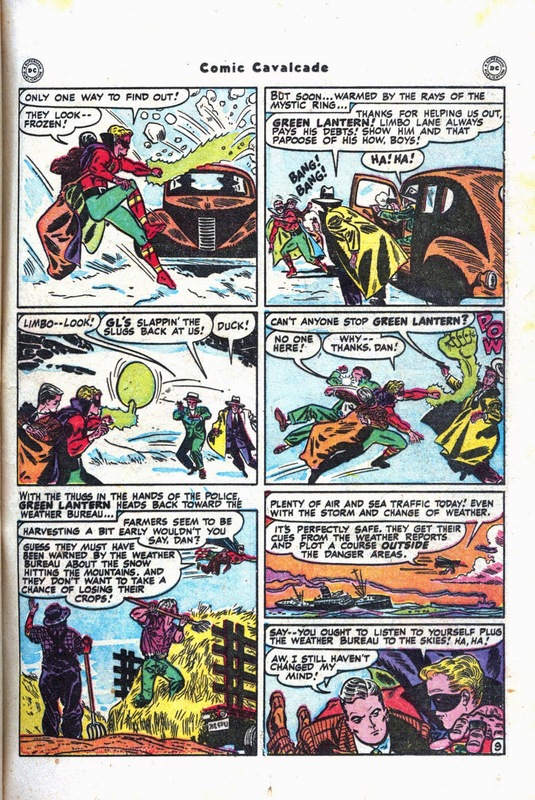 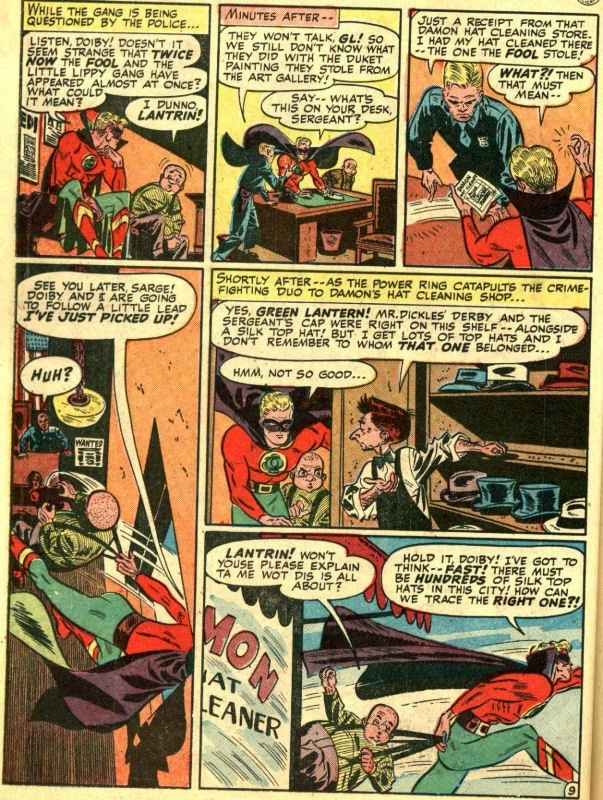 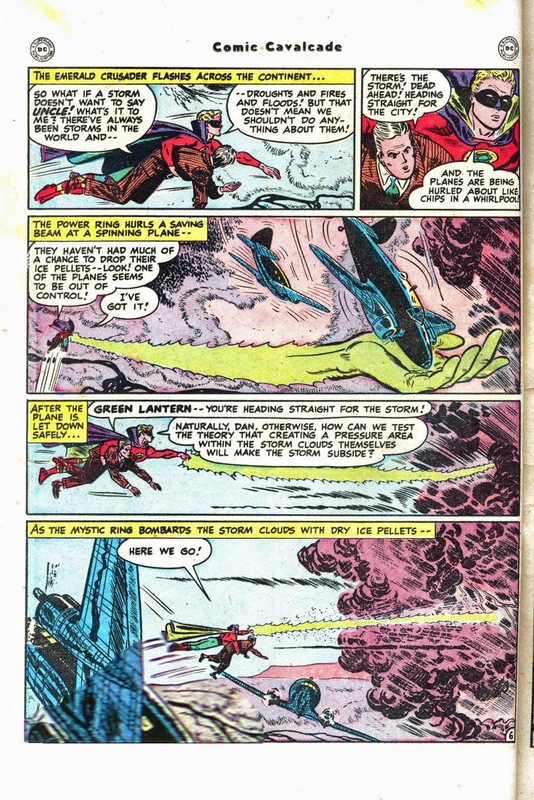 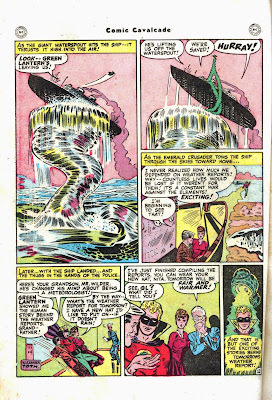 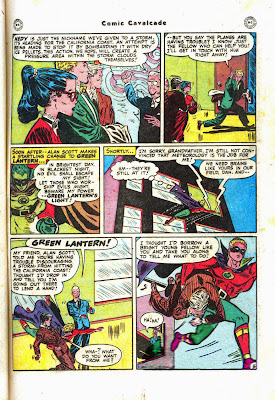 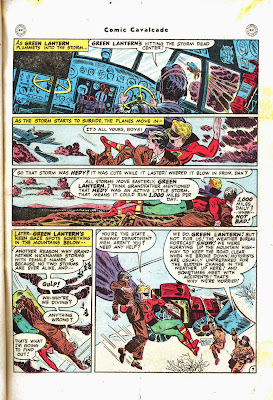 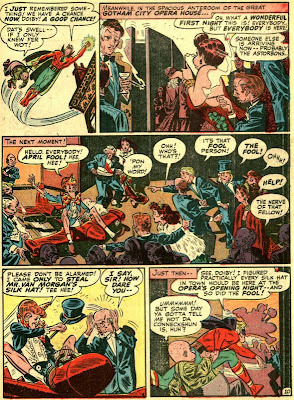 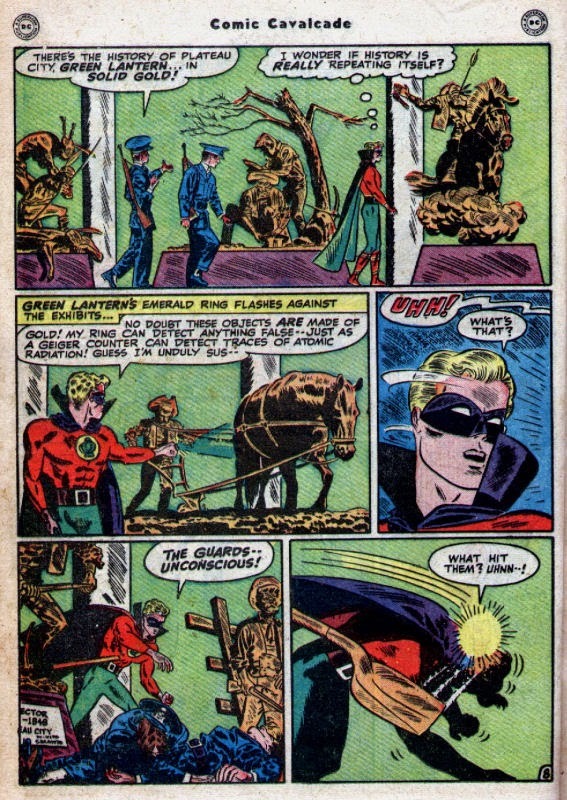 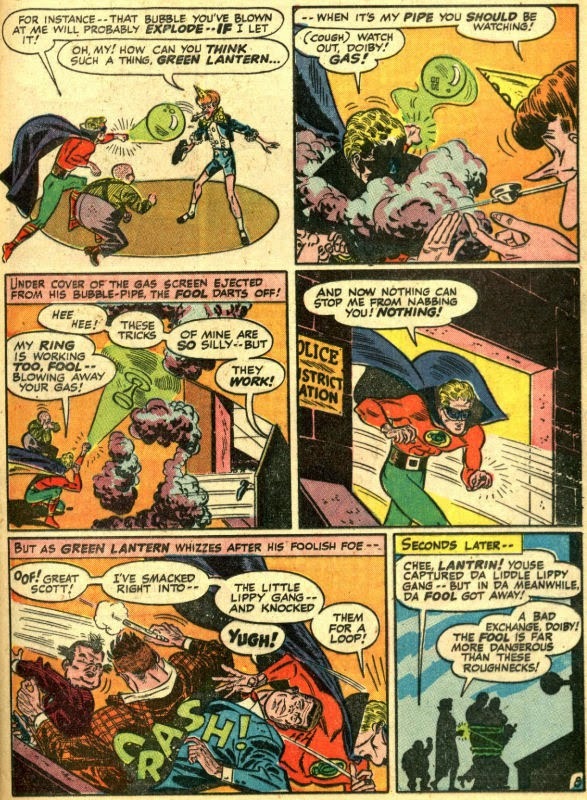 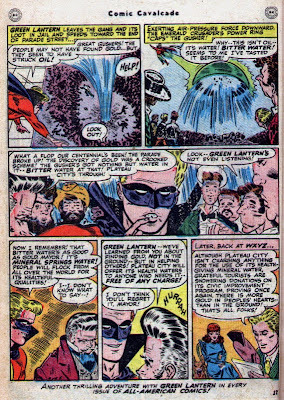 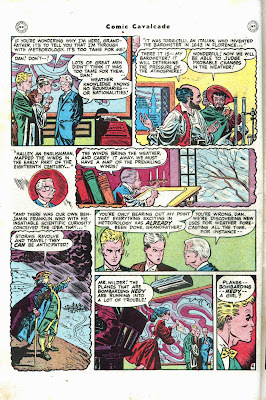 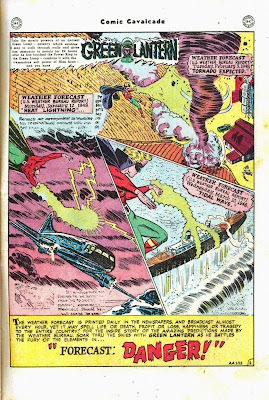 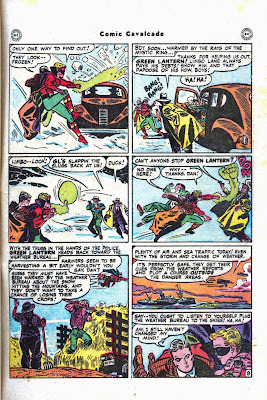 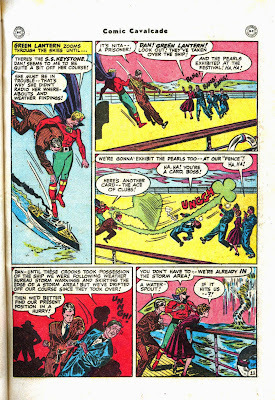 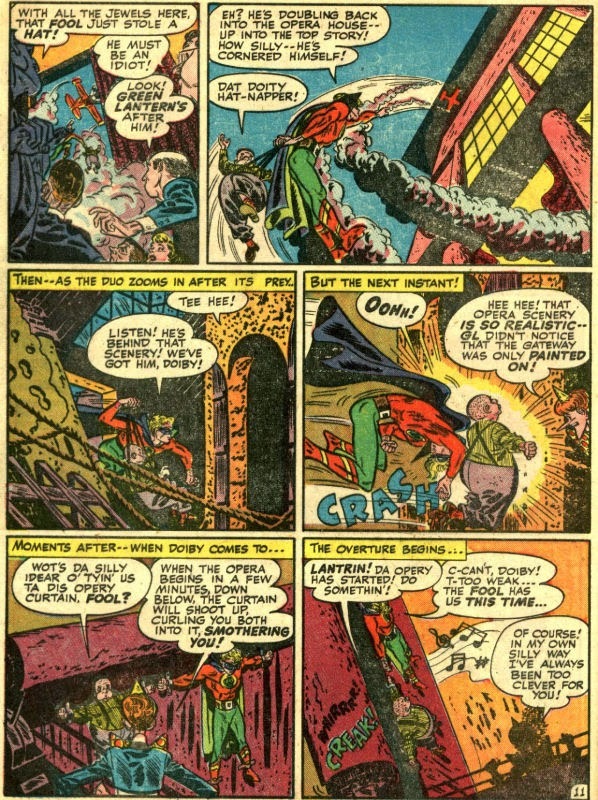 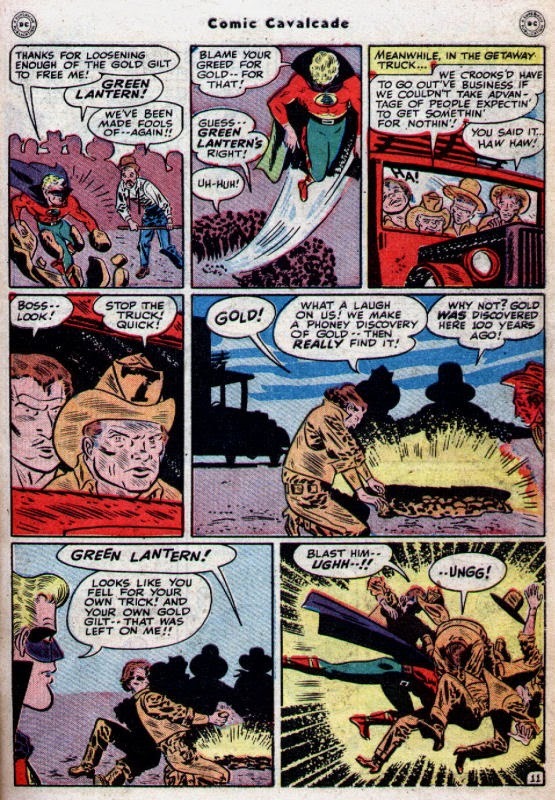 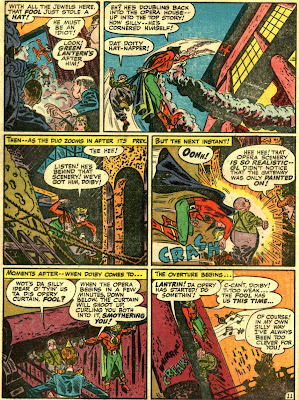 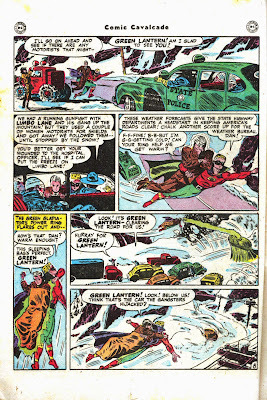 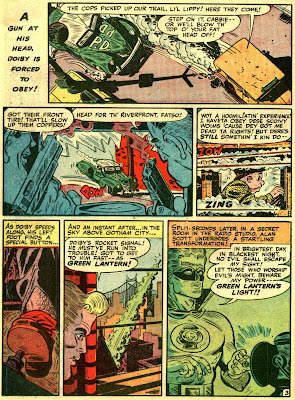 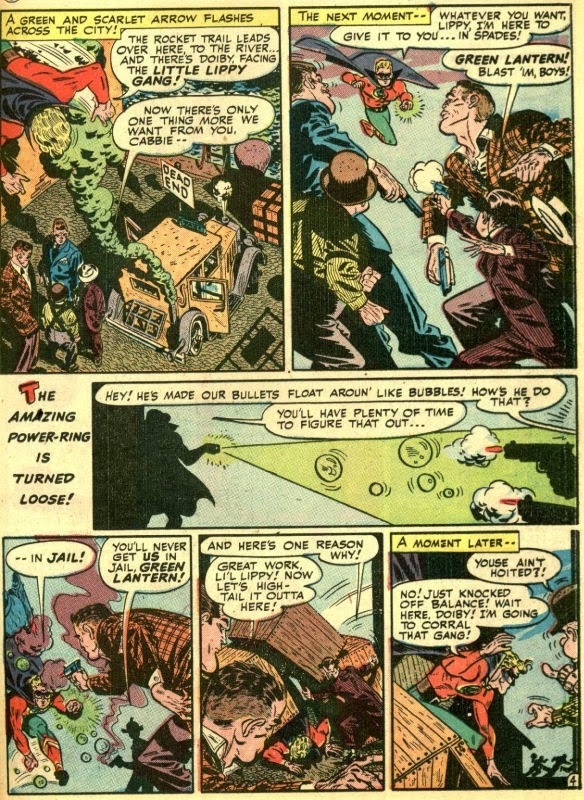 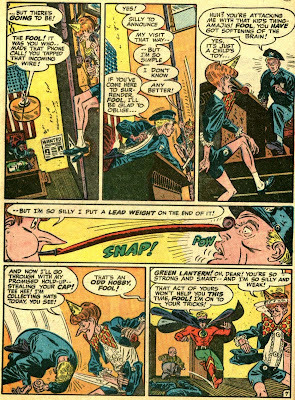 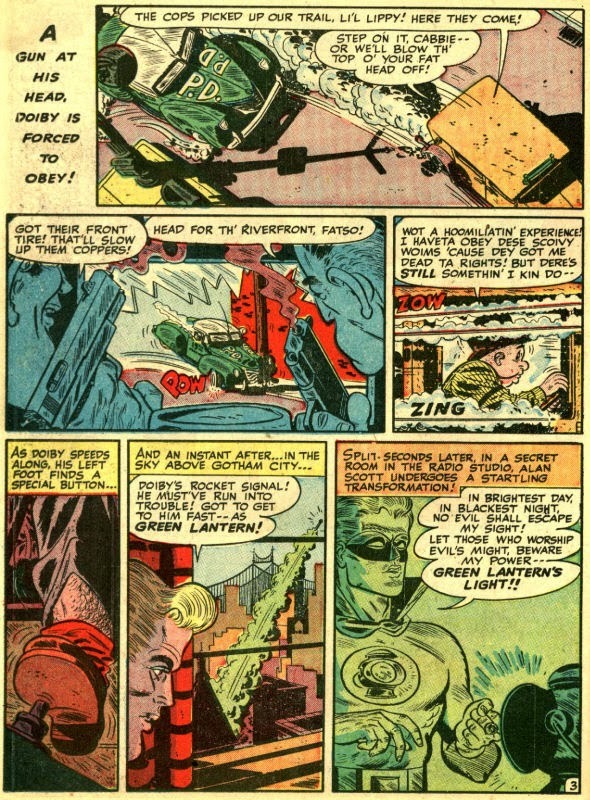 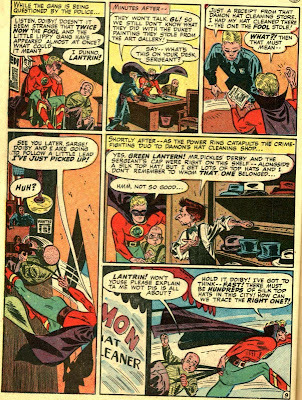 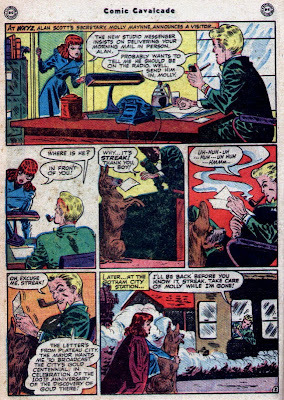 In the late forties Alex Toth drew three Green Lantern stories for DC's Comicbook Cavalcade. He was still learning his craft under the tutilage of editor Sheldon Mayer, but it is fun to see how fast he grew over the course of three consecutive quarterly issues. And how much of his designer/storyteller was already there. 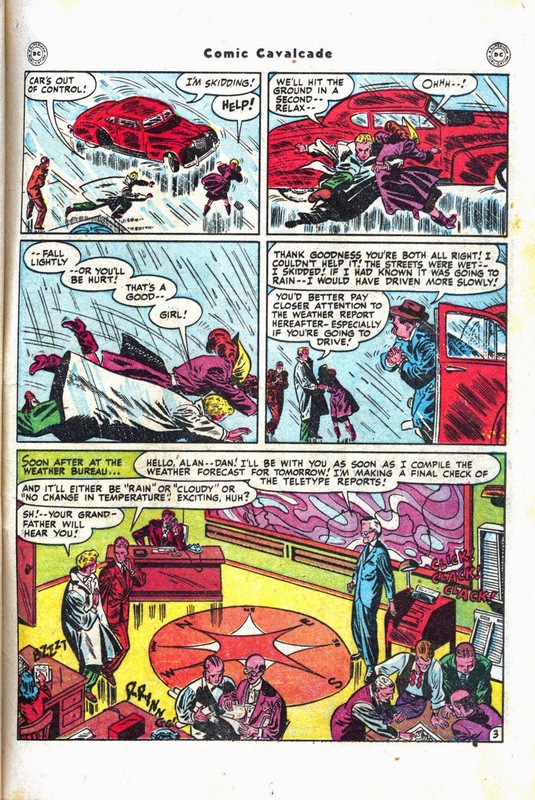 If you look closely at the splash pages, you'll see that these stories were ofte made long in advance of publication and shoved around quite a bit. 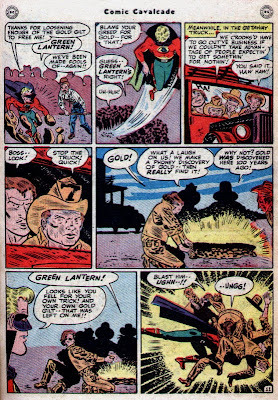 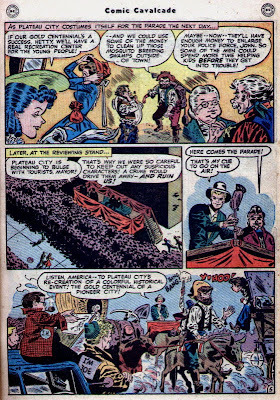 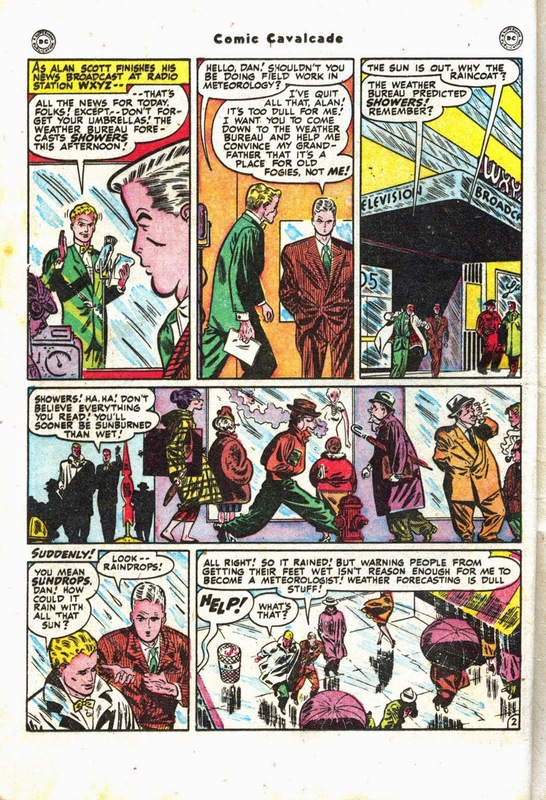 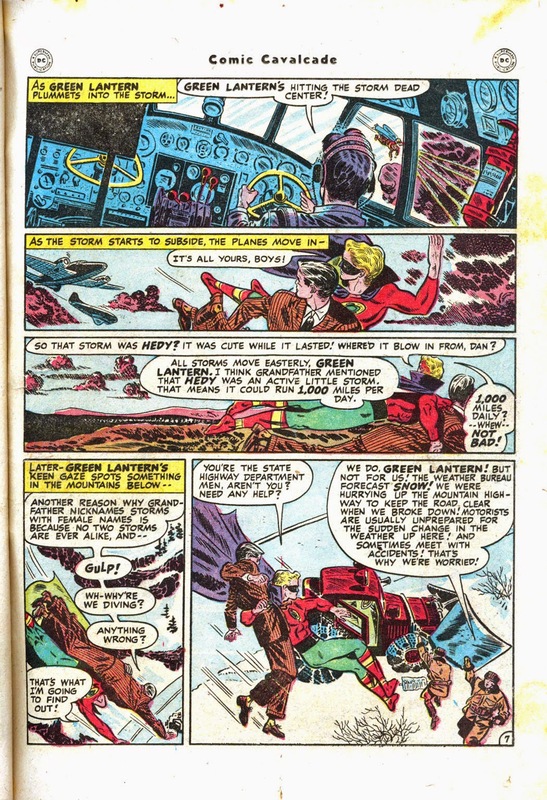 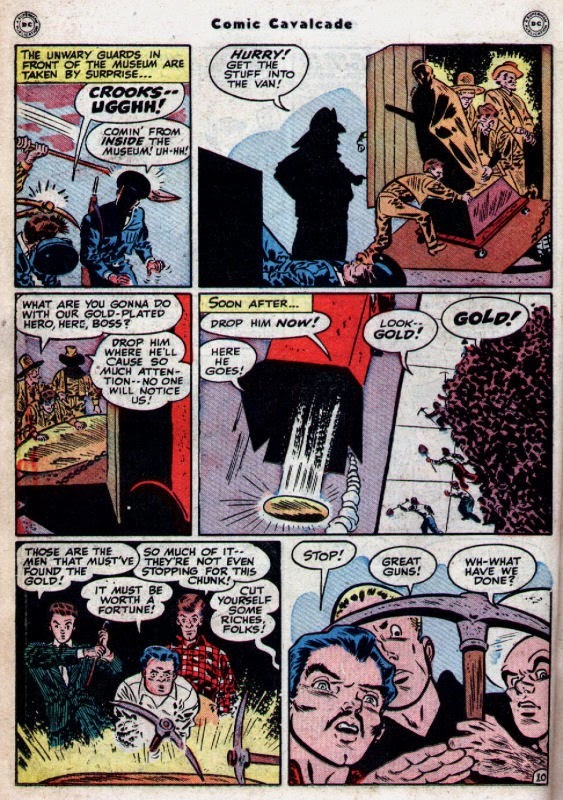 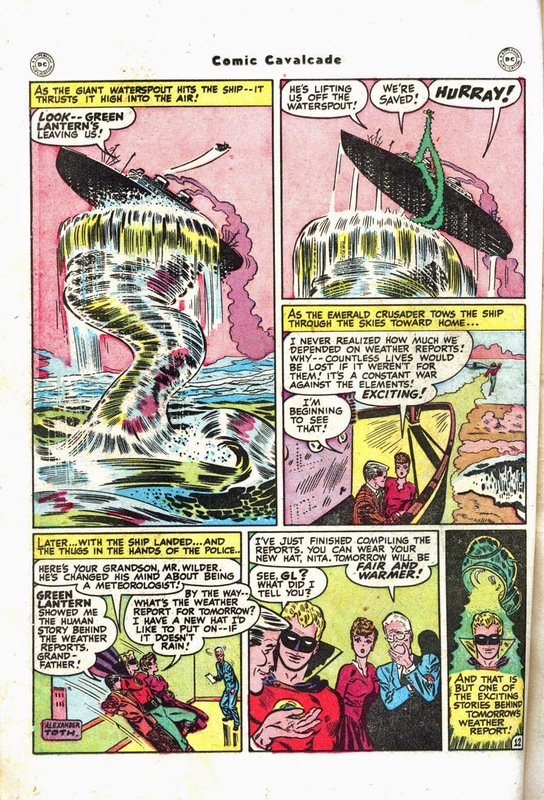 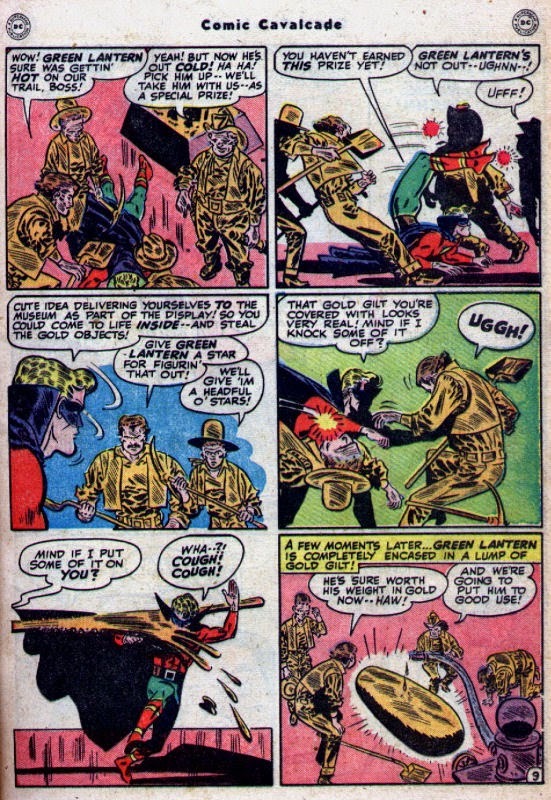 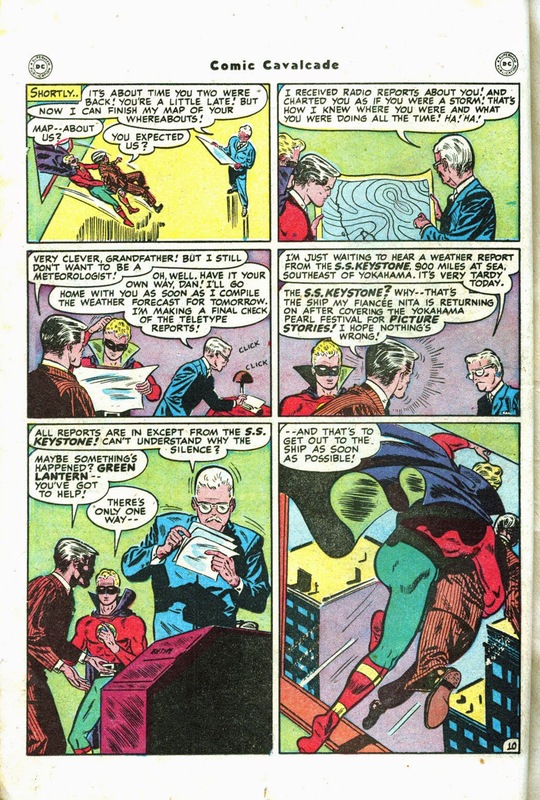 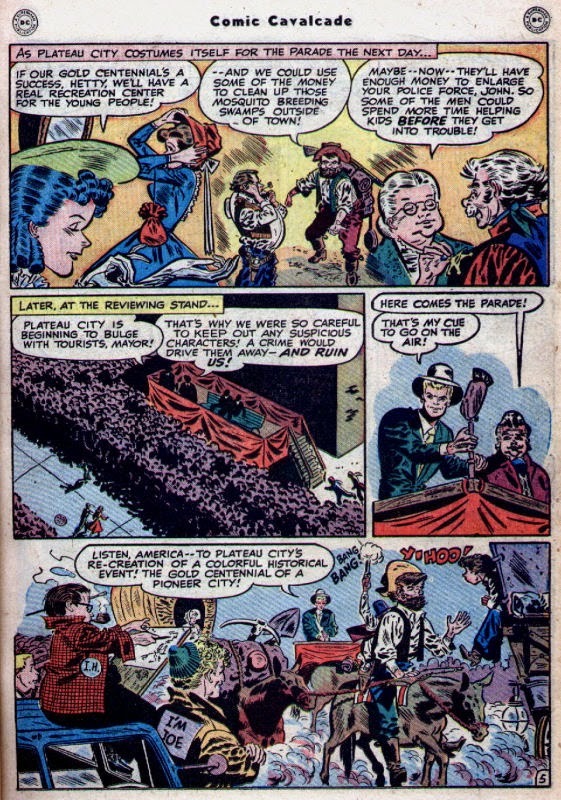 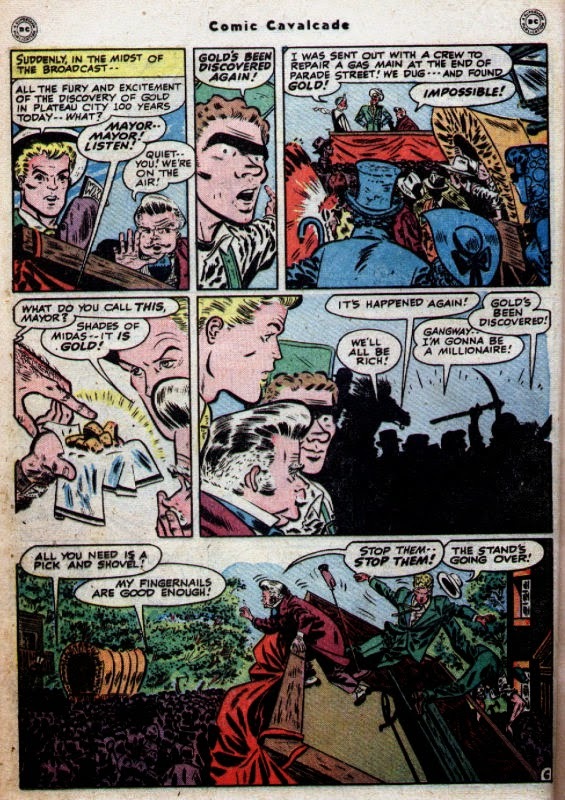 The first story (in CC 26) was made for AA 101, which I presume is All-American #101, a pretty late DC book and one of the last to have Green Lantern as well as Jhnny Thunder before the whole book became a western series. 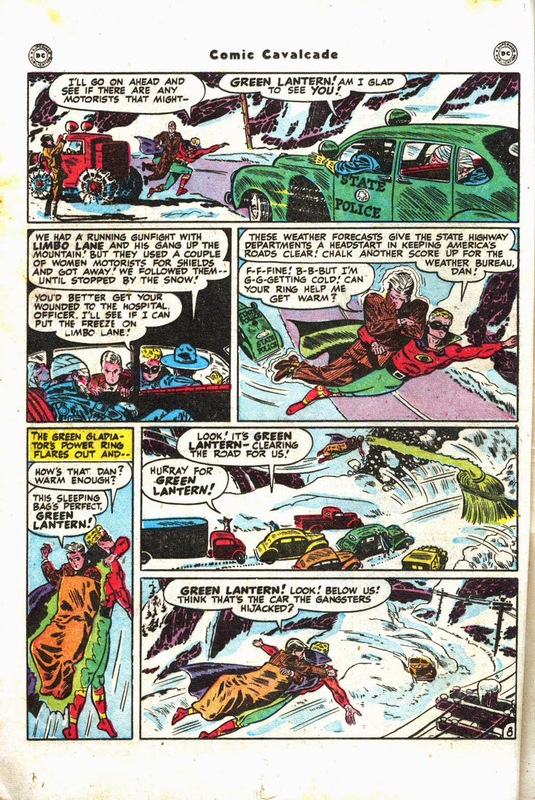 The second story is produced for CC 26, so apparently one issue earlier (eventhough it seems to be the most mature of the three) and the third one was intended for GL #38. 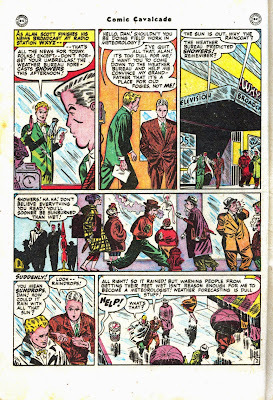 As far as I know, no opne has ever tried to make a list of all these Toth stories that takes these production numbers into account. Some quick checking tells me that these stories were published in 1948 and 1949, which means that they were done when he was about 20 years old. 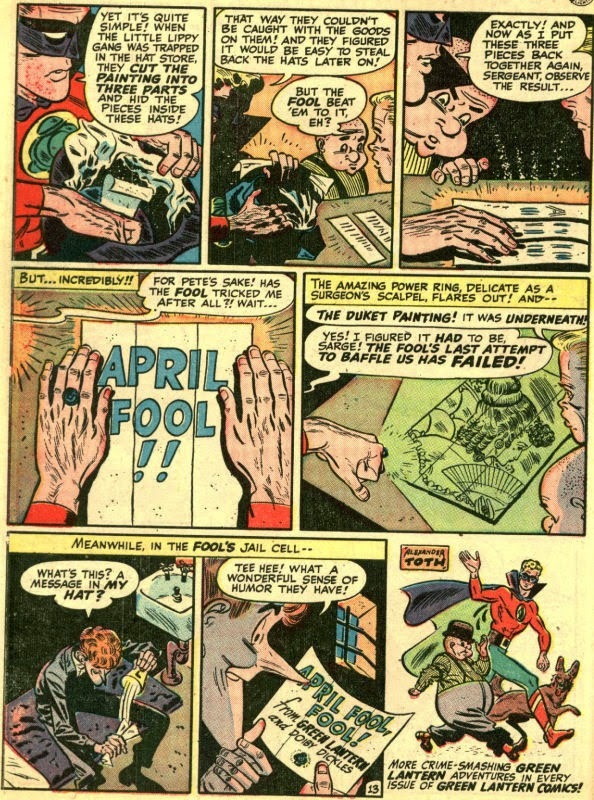 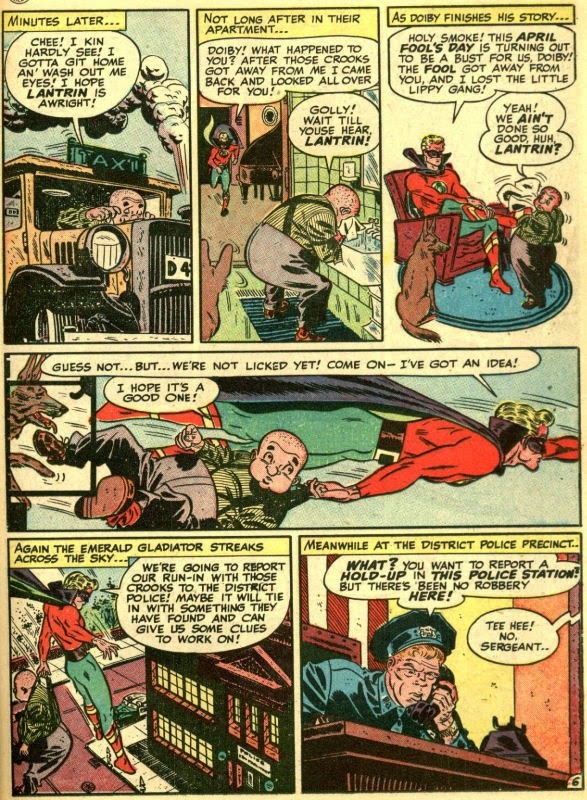 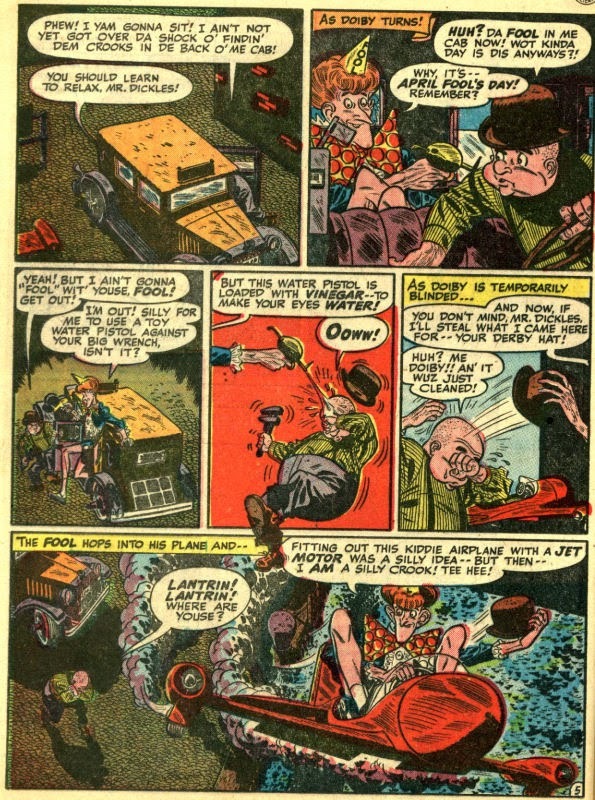 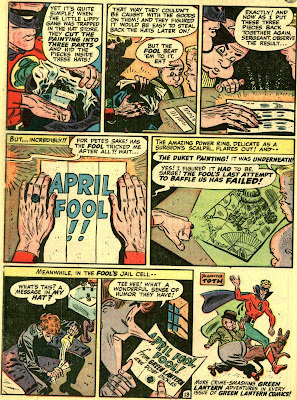 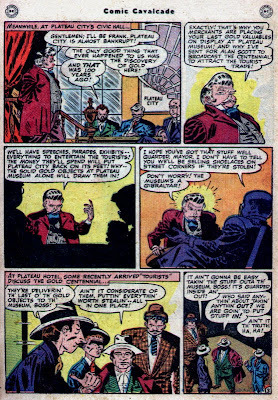 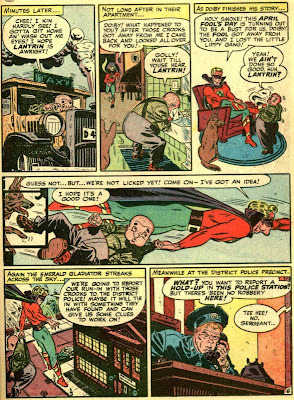 I think he started working for DC in 1947 after graduating from art school, so these are really from quite early in his career. 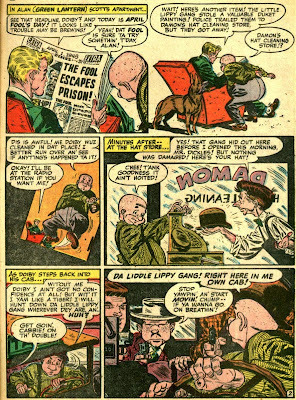 He was already slick as hell, but his anatomy was still weak and cartoony and the faces seem oddly shaped and the features too small. 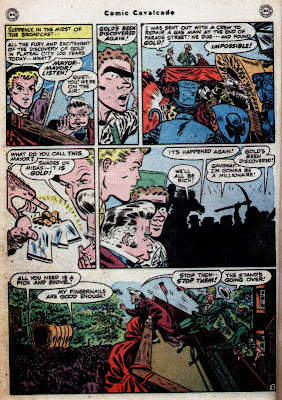 I also notice that he had the bad habit of drawing character's heads too close to the panel border, leaving them mostly outside the panel itself -- almost like an after thought. 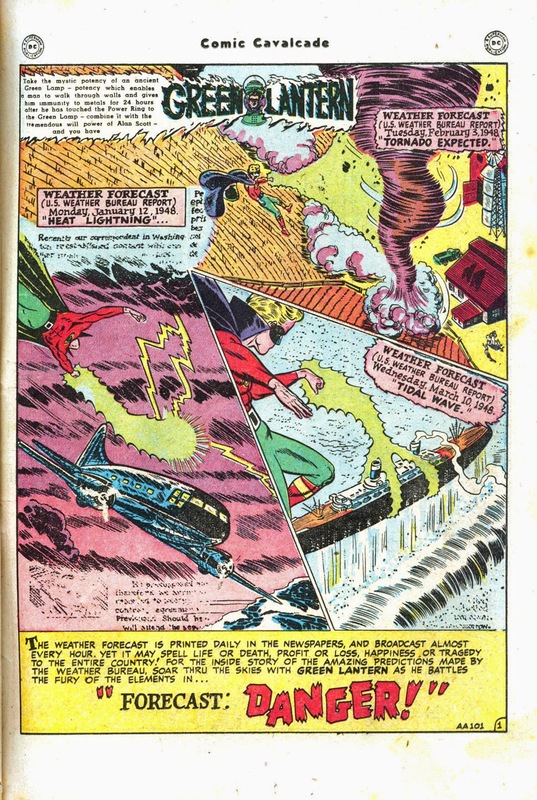 I wonder what old Alex would have said about these pages if he could have critiqued them without realizing they were his own work. 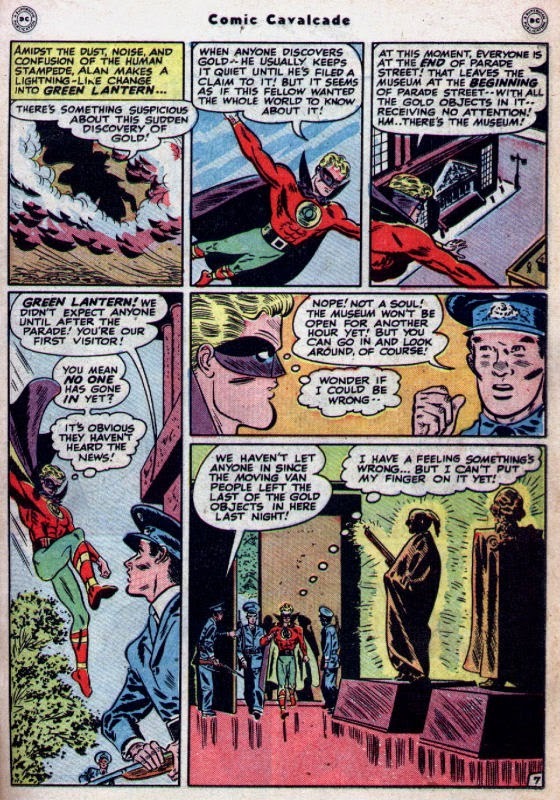 I don't think he would have been too understanding. 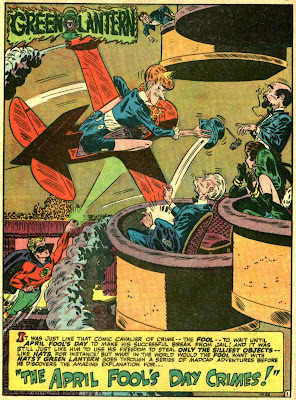 Still, it's amazing how much somebody's talent can grow and mature. 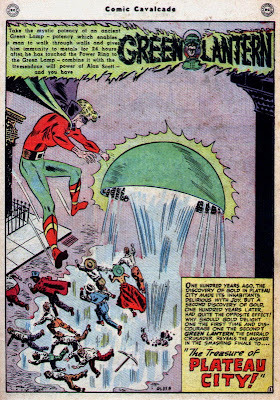 He was awesome.